One item which should definitely be on your pack list, especially if you’re headed to a country like India where power outages can occur almost daily, is a flashlight. Even if the power is working fine, you may need a flashlight to light your path after the sun goes down. If you haven’t bought a flashlight in years, you should know that LED lights have truly revolutionized the flashlight industry, allowing manufacturers to build flashlights that pump out mind-blowing levels of light in incredibly small packages which can withstand much more abuse than flashlights of old. With small size, high performance and a budget in mind, here are four great options to light up your life on the road. These keyring LED flashlights are very small, yet bright enough to illuminate a dark path on your walk home. The operation is simple: you squeeze the light to turn it on momentarily, or if you need it on for longer, just flick the switch to keep it on. At under $10 for a 10-pack you can carry extras to use as backups or to give to people you meet along the way, as these make great little gifts. Each light will likely last you a year with regular use on the included batteries, and probably longer. For the price of new batteries you may as well just buy new lights (though if you’d rather replace the batteries, these run on two CR2016 coin cells ). 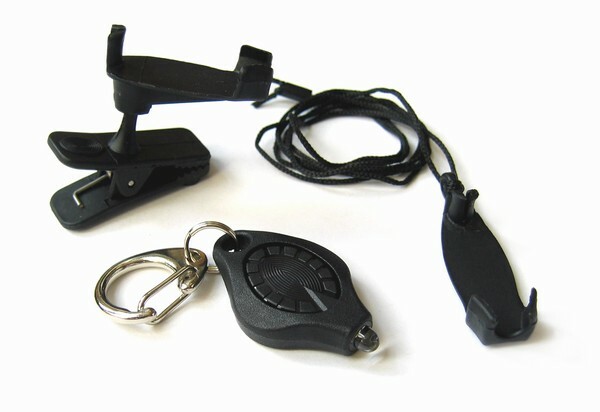 Note that 22,000 MCD (milli-candela) refers to one means of measuring light output, so if you see similar cheap keychain LED lights which don’t mention this, they may not be as bright. 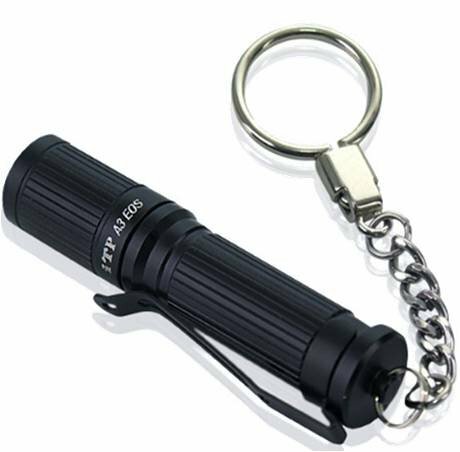 If it seems to you that this light (pictured above) looks incredibly similar to the cheap keychain lights, that’s because the Photon lights are the keychain LED lights which many other manufacturers have tried to imitate. Such imitations are also known as “fauxtons” by flashlight enthusiasts for this very reason (a play on “photon” – “faux” meaning “fake” in French, for those who don’t know). While the fauxtons may resemble the Photons in appearance, there’s a huge difference in features and quality. The lights are water resistant and feature gold-plated contacts for corrosion resistance. Each light comes with a quick-release key ring (very handy when you need to remove the light from your keys), a necklace attachment to allow you to wear the light around your neck, and a hands-free clip which can be used to clip the light to the brim of your cap or onto your bicycle (and it’s even magnetic if you need to attach the light to something metallic). All lights are made in the U.S.A. and come with a lifetime warranty from the manufacturer. There’s also a variety of beam color options including every color of the rainbow. White is definitely the brightest light and the best choice for lighting a path, but I can personally recommend the red light as a small but effective rear bike light (used in the medium flashing mode) and the yellow light for a warm reading light. In terms of brightness, the Photon Freedom and the cheaper generic 22,000 MCD keychain lights are about the same. The Photon Freedom may be brighter with new batteries, but this edge soon fades and in the long run I’d say the brightness levels of the two lights are about the same. The white light will give you 10 to 12 hours of run-time at full brightness with the included batteries, which means it will likely last you at least a year even with regular use. The red, orange and yellow version of the light will last much longer, around 120 hours, because they use different batteries. When it comes time to replace the batteries, Photon Freedoms use two CR2016 batteries , with the exception the red, orange and yellow lights, which use one CR2032 battery . Because the cheaper “fauxton” keychain lights above use the same CR2016 batteries, you can salvage a pair from one of those lights if you need to, although note that the batteries that come with the fauxton lights won’t last as long as the name-brand Energizer batteries that come with the Photon Freedom. The white Photon Freedom runs around $12 shipped from Amazon. The Generic Cheapies vs. the Photon Freedom – which to get? 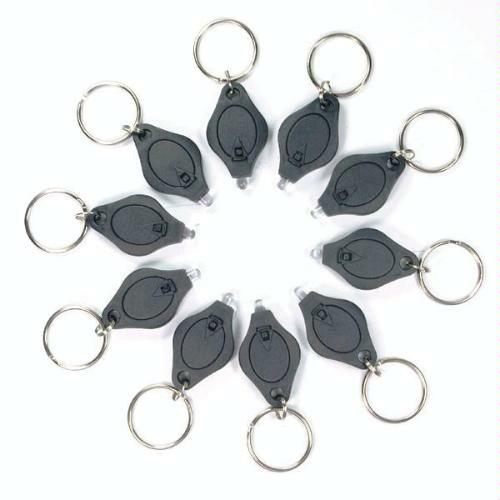 Given that you can get 10 of the generic keychain lights for less than cost of a single Photon Freedom, you may be wondering whether it’s worth it to get the Photon Freedom. If you must choose between one or the other, I suggest getting a 10-pack of the generic 22,000MCD lights. They’re an excellent value for the money and you’ll be covered for flashlights for yourself with extras to spare as gifts. If after owning one of the cheaper keychain lights for awhile you find yourself dreaming of the ability adjust brightness levels, use it as a strobe light or take it through the rain without worry, then consider upgrading to a Photon Freedom. If the extra money isn’t a big deal to you and you love gadgets, I recommend buying both right from the start. You won’t be disappointed. The incredibly small lights above are very capable for lighting up areas within 20 feet (6 meters), but if you want a flashlight that can really throw light up and off your path, check out the iTP A3 EOS . It’s rated at a whopping 80 lumens of output despite being about the size of your pinky finger and running on a single AAA battery. Since you may have no idea how bright 80 lumens is, let me put it another way: when you turn this thing on at full power in a dark room, your reaction will probably be something along the lines of “Holy s***! How does something this small put out that much light?” If you’ve ever used a MagLite Solitaire, the well-known flashlight brand’s single AAA flashlight, this light will make you fully realize how LED flashlights are leaps and bounds ahead of the old filament bulb flashlights (and it might make you wonder how MagLite can still be selling those lights given how pathetically inferior they now are in comparison). The iTP A3 EOS comes in both a single-mode version and a 3-mode version . With the single-mode version, twisting the lens cap turns the flashlight on or off – plain and simple. With the 3-mode version, you can switch between brightness levels of low, medium or high by turning the flashlight briefly off and back on again. Unless this sounds complicated to you, I definitely recommend the 3-mode version, as it’s nice to be able to switch to the low mode for using the light close up (i.e. looking at a cut on your finger in the dark where the high mode would be blindingly bright), the medium mode for walking at night but preserving battery, and the high mode for when you need that extra light to make sure you’re not being tracked by man-eating tigers (or whatever scary animals lurk at night around your travel destination). It’s made from aircraft grade aluminum, and given this and it’s small size, it’s so light you won’t even notice it in your pocket or clipped to your belt. The light will last for about 1 hour on high power, 4 hours on medium power, and a whopping 50 hours on low. It can run on a regular AAA alkaline battery or a NiMH rechargeable. Someone always wants to know what the brightest light out there is. Well, this is the brightest flashlight (at the time of writing) that runs on a single AAA battery. It’s rated at 85 lumens of light on maximum – suggesting only a slight advantage over the iTP EOS A3 on paper, but real world testing suggests that the difference is more significant (yet another case of manufacturer ratings not matching up with real world results). 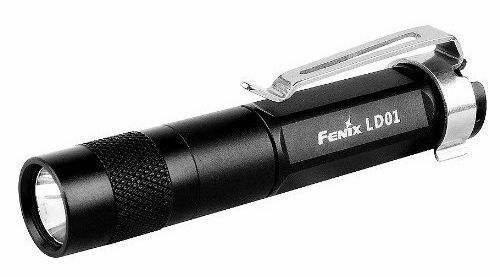 Fenix is a well-known and reputable brand in the world of LED flashlights. This light is made of aircraft-grade aluminum and has the added benefit of being waterproof to IPX8 standards, which means it can survive being immersed in water beyond 1 meter in depth. The LD01 will run for 1 hour on high, 3.5 hours on medium power, and 11 hours on low (it’s low setting is set at a level significantly brighter than the iTP EOS A3’s is, hence the shorter runtime). It’s backed by a 2-year manufacturer warranty. It’s available for about $40 shipped – not as cheap as the iTP EOS A3, but if you want the brightest AAA flashlight out there, this is it. For either of the AAA flashlights mentioned above, regular alkaline batteries won’t last as long, so I recommend using a good NiMH rechargeable AAA battery, such as one of the Sanyo Eneloop AAA batteries . And don’t forget a good travel charger if you plan on charging your batteries on the road (the USB charger listed there weighs next to nothing). Have fun – and try not to stare directly into your new flashlight (I know you will).